I recently finished a book (I’m a little embarrassed of the title…let’s just say it’s one of my strictly for pleasure books, okay, series) that discussed clones, and it got me thinking about the old nature vs. nurture debate. I wrote a paper on this in high school, which did not endear me with my English teacher (probably the one English teacher who didn’t like me, as it was always my best–and sometimes only good–subject) as I filled the supposed-to-be-research paper with anecdotes about me, my friends, and some I’d even gotten in books. (I thought copying over good stories from research books was enough research for a paper like that. I learned that lesson quickly). My conclusion was, adamantly, that nurture is all that matters. We are what we make, do, become. In the book I just read, the police officer encountered an entire school full of perfect females that had been cloned. When several murders were committed by a clone, it got problematic when it turned out the clone and her two “twins” had taken turns committing said murders. Their lives had been the same: they’d been married off to one man, and were able to switch between him and several exotic locales every few years. They’d even given the man children. They called themselves “we” and acted like the same person. The psychologist in the story argues that they can’t be the same; they must have had some differences in their upbringing. When it turns out they didn’t, she agreed they were all, basically, the same person, having the exact same thoughts. I disagree with this. I am one of those “every choice could make a vital difference” types of people (which is why it’s so hard for me to make any decision) and even though these women had almost identical upbringings, they didn’t have the exact same experiences. Sure, they would take turns hanging out in Italy, but surely the exact same things did not happen to their twin when she took her year in Italy. I mean, one woman would go to the store, and meet a certain grocer that wouldn’t be there when the other her twin when to pick up some milk. A storm would flood the house, which wouldn’t happen at the same time under the same circumstances when her twin took her turn the next year. It is our experiences that shape us, after all, not necessarily how we were born and who we were born to. Sure, maybe there are some things that are predestined (that’s a whole different ball game), but I find it interesting that in this same book, the main protagonist is a self-made cop. She doesn’t seem to find any caveats with the fact these women are all claiming to be the same, and she often questions whether they are thinking the same thing at the same time. I guess I don’t know much about cloning–in truth, it really creeps me out, so much so that the extent of my knowledge is about Dolly, that Scottish sheep that was cloned some time ago. (I’m obviously really knowledgeable on Dolly, as well). Also, with the work I do (as in, with underprivileged children with pretty much a zero chance of graduating high school) I can’t really believe that nature will always triumph. There is that old adage “blood will tell” which I think is bogus. I wouldn’t be doing this job if I thought these kids would end up exactly like their parents. So, I refuse to believe that because I was born with certain genes I am destined to be a certain way. Which is why I can never decide what to eat for dinner, much less whether to go to grad school (and what to go to grad school for). It’s time for my first movie review! And, fittingly, it’s for one of my favorite series. The last movie (tear) was really quite good. It didn’t have the charm of the 6th (one of my favorites) but it also left some of the angst from Part 1 behind. Like with every movie, there are small things left out (sometimes several words that I think really made the scene in the book) but, after all, when does the movie really live up to the book? Especially such a book, filled with webs untangled, mysteries revealed, heart-wrenching moments, and J.K. Rowling’s incomparable storytelling. 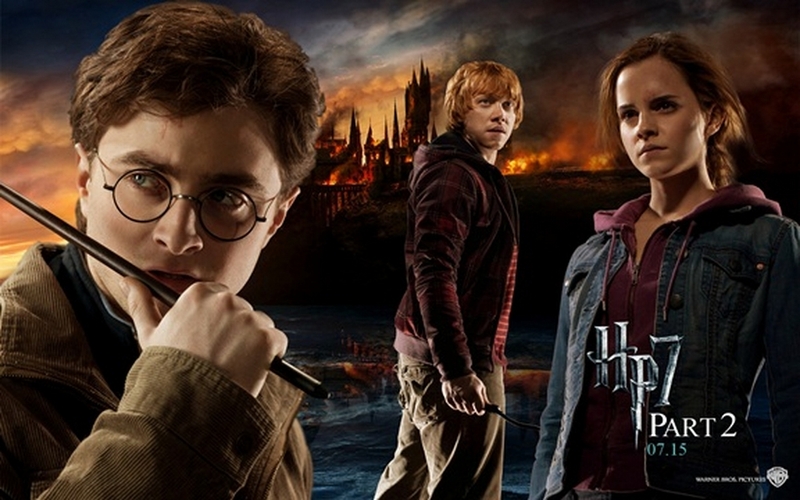 The movie, unfortunately, failed to capture (**spoiler alert**) the sheer elation of Harry and the rest of the Wizarding world upon the defeat of Voldemort, but it did a decent job of grabbing the bittersweet moments of growing up, and then watching your children leave you, as well. There were certainly the triumphs–Ron and Hermione kissing, the death of Voldemort, Snape’s true allegiance–and the heartaches–the Resurrection Stone, Fred, Harry facing his demise. I had a big problem with Harry telling Ron and Hermione he was sacrificing himself, and with him simply breaking the Elder Wand in half, but these details still did not detract from the overall feeling of the film. The ending was corny, of course–as was the books–but hey, doesn’t Harry deserve a little corniness after all he’s been through? Although I must say, Hermione ages really well. I have read that many critics are calling this the best movie–my favorites are still the 4th and 6th movies–but it is a satisfying end to the series. It was fun to watch several of the older movies before watching the finale. While the characters have changed immensely, they still have the same core about them–Emma Watson, while she has certainly physically changed, doesn’t sound so much different from her eleven-year-old self meeting Ron (who is eating, no surprise) with a bit of disgust and disdain in her voice. And Harry, of course, remains his troubled yet awed by this new world self as he has from the beginning. Ron remains the brave, goofy sidekick–although I am glad that Ron had his heroic moments, as well. One of Rowling’s most powerful abilities is to, while giving her characters slots, is to also make them immensely more complicated that merely the hero, the sidekick, and the smart best friend. The movies, for the most part, give us a glimpse of these complications, and let’s us visit their world and get to know the characters in a different way from what the books provide. I urge anyone reading this, if they have not done so, to read the books through and through, to truly gain the magic of the tale of Harry Potter. It’s hard for me to describe how much these books have affected me; not only did they help me learn about right and wrong, the power of humanity, the immense changes present in every life, they also enhanced and deepened my already dear love of reading and writing. If one woman can create a world like this, a world that really has impacted our world, what kind of world can I invent? The books also gave me a glimpse of the sheer complications of people, and a fascination that still exists today. I feel like I am not doing a very good job at explaining what these books mean to me…so much for my years of English literary education, huh? Anyway, while there are certainly gaping holes in the movies, they provide a good foundation for the stories, and if anything, make the stories even more British. I kind of don’t want it to ever end–but we must put away childish things. 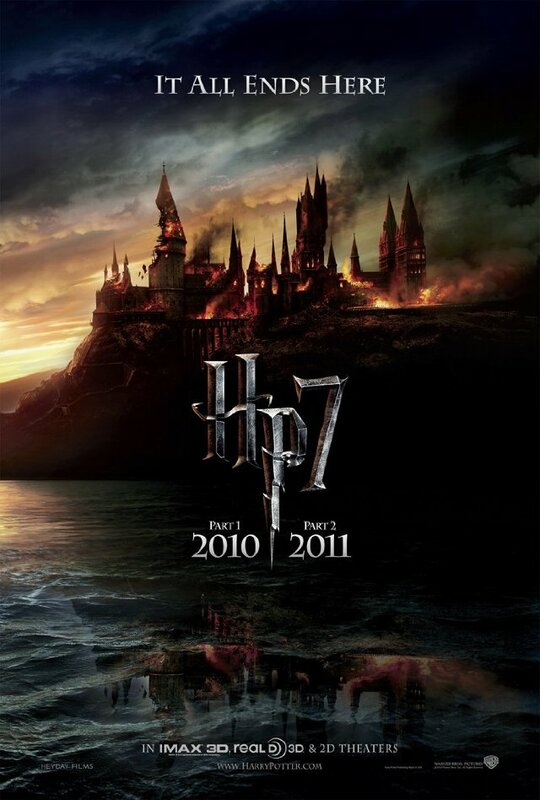 Well, ladies and gents, this weekend I FINALLY got the see Harry Potter and the Deathly Hallows: Part 2! In IMAX, no less. It was my first IMAX experience, additionally, and it was kind of insane. Just another thing to add to my I’m-a-little-town-girl-in-a-big-city-now feeling! The LAST movie was a bittersweet feeling. I’ve been obsessed with the series ever since that fateful day in the library, at around age 10, when I gathered all of books from the “New This Week” section into my weekly reading pile, as was my custom (I was really cool) and among them was Harry Potter and the Sorcerer’s Stone. No one else in my town had really heard of the book, all of my friends thought I was insane when I told them all about this wizard kid named Harry Potter, written by some guy named J.K. something. (Sorry, Ms. Rowling, I have no idea why I thought you were a man…forgive me in my naivete). Well, now, fifteen years later, it’s a worldwide phenomenon, and while my inner rebel always wanted to eschew the phenom, I never could. As a kid who relied on the characters of books to be her main social life, Harry Potter and his cronies were some of my best buds. This last movie parallels my life strangely. No, I’m not on an epic quest to save Wizarding kind or the world, but I have moved away from my hometown and my parent’s house with the intent never to return again. I have left my childhood behind–and this movie is a symbol of that. Harry’s childhood ends too, rather abruptly, and while I held on to mine a little harder–I am 24, but part of the continued living-at-home was forced by the economy and my obsession with international travel–it still is a phase over. The books and movies themselves were also such a major part of my childhood, that the ending of them also symbolizes a new phase. Every book has been linked with my various ages, and while I can read and watch them again–and believe me, as obsessed as I am, I will–but they are over. Time to say farewell. Just like the end of a childhood, the end of the book series, while it can be mourned and celebrated, also disappears quickly in the new details, troubles, and joys of the new chapter. So, no, while my days are not spent on an endless camping trip, hunting Horcruxes, and my childhood is not ending on an epic quest, I am starting a new (very much less epic) quest of my own. So far, my days are spent going to the movie theatre alone, being a VERY TEMPORARY house-wife for my now live-in boyfriend (a.k.a I get the mail, clean the tub, make dinner and bake a lot…whilst reading and writing as much as I can) and getting lost every time I drive out of our apartment complex. And I must say, these events are quite epic for me. Stay tuned for further excitements and trials in the big city! Plus the beginning of my new job on September 1st! I have discovered a new, most beautiful site: Pinterest! That’s right…you can collect bits and pieces you find all over the internet, and “pin” them all to one place! I love this because I constantly am leaving tabs open for days to remember something I find, saving random pictures of beautiful places to “find” them later, and copying recipes into Word documents. Come check out my site here! In the meantime, I was recently reading some good how-to-blog advice at Peanut Butter Fingers, a health and fitness blog I follow, and she suggested that it’s best to find a FOCUS for a blog. Perhaps I should just enjoy being unfocused for a little while longer.